Editors note: If you're celebrating in 2017, check out our updated guide here! Halloween is just around the corner -- which means it's time to grab your friends, flashlight and courage. The Curse of Frau Mueller (50 Florida Ave. NE) -- Now through Nov. 1, roam 50,000 square feet of terror as you listen to spooky background stories. 7-11 p.m.; tickets are $30-$50. Fright at the Museum (575 7th St. NW) -- From Oct. 23 to Nov. 1, visit the Crime Museum for a night of creepy fun. Roam through this haunted house and view an actual electric chair used in hundreds of real executions. Keep in mind you'll be seeing it in the dark. Tickets are $30; entry times vary depending on ticket. Nightly Spirits (1475 Pennsylvania Ave. NW) -- This 2.5-hour walking downtown pub tour is led by a costumed tour guide. Explore haunted pubs and buildings in D.C., and at each stop, listen to a popular ghost story as you sip on a cool beverage. Tues.-Thurs. $25.95/person; Friday-Sat. $32.95/person. Ghosts of LaFayette Park (1520 H St. NW) -- Explore the dark past of our nation’s capital at “Tragedy Square,” filled with crime, conspiracies and assassination. Tour begins at 8 p.m. $17 for adults; $10 for children ages 7-11. Capitol Hill Haunts (303 Pennsylvania Ave. SE) -- Find out the curse that lurks on the Hills as you watch famous status that dance in the night. Tour begins at 9 p.m. Monday-Sunday; $17 for adults; $10 for children ages 7-11. Laurel’s House of Horror (371 Armstrong Ave, Laurel) -- Located in Laurel’s historic district, this old movie theater is the newest edition to Maryland’s haunted house attraction. Zombies, clowns and other creepy beings (i.e., actors) are waiting to scare you at every corner. $15 online; $20 at box office; $30 speed pass. ; dates vary. Bennett’s Curse Haunted House (82024 Max Blobs Park Road, Jessup) -- Now through Nov.1, visit this haunted house and find your way through frightful mazes with special effects. 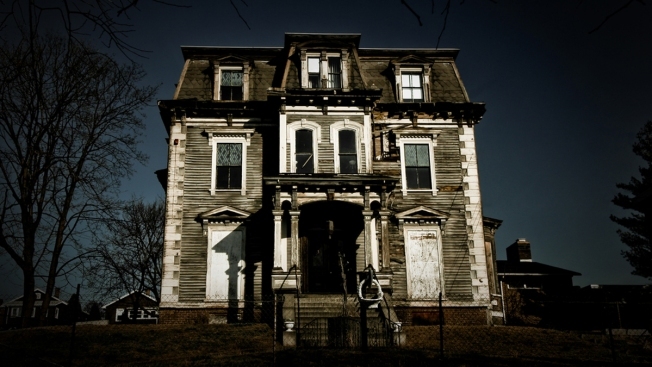 It takes about 40 minutes to walk through this haunted house, known as one of the largest in the Washington/Baltimore area. Thursdays and Sundays 7-10 p.m.; general admission $30. Markoff's Haunted Forest (19120 Martinsburg Road, Dickerson) -- If you’re looking for a change of scenery, take a hike through a terrifying forest. Every weekend in October, you can choose from two creepy trails, take part in a zombie hunt, or zipline above it all. Oct. 10-11, and then Thursday through Saturday nights through Oct. 30-Nov. 1; opens at 7 p.m.; ticket prices vary; see website for more information. Nightmare Manor (10240 Fingerboard Road, Ijamsville) -- Throughout October, enjoy tasty concessions, live magic and and eyeball toss at this 200-year-old cursed estate. Thursdays and Sundays 7-10 p.m.; Fridays and Saturdays 7-11 p.m.; tickets start at $20. Field of Screams (4501 Olney-Laytonsville Road, Olney) -- After walking through the Trail of Terror, seek revenge as you battle zombies in a game of glow-in-the-dark paintball. Sundays and Thursdays 6:30-9 p.m.; Fridays and Saturdays 6:30-10 p.m.; see website for ticket prices. Shocktober (601 Catoctin Circle NE, Leesburg) -- Three haunts. One location. Dare to walk the haunted halls of Paxton Manor, the Haunted Well of Souls, and the Last Ride. Fridays, Saturdays and Sundays in October; 7-10 p.m.; prices vary. Route 29 Haunted Farm (4484 Lee Highway, Warrenton) -- On every Friday and Saturday through the month of October, tour the Buckland Farm Market for a 20-minute walk in the night. During the day, enjoy pumpkin patches, moon bounces and hayrides. Fridays and Saturdays in October, plus Nov. 1; tours begin around 7 p.m.; tickets $15. Darkwood Manor (104 N. Hawksbill St., Luray) -- Enjoy this theatrical haunted house and witness talented actors, detailed sets and original scary stories.Fridays and Saturdays in October, plus Oct. 30 and Nov. 1; 7-11 p.m.; general admission $12; FastPass tickets $24. Fear Forest (Oak Shade Road, Ashby) -- Aside from walking down a spooky woods trail and getting frightened by zombies, you can take part in a zombie laser hunt and haunted hayride. Fridays and Saturdays in October, plus select weeknights through Nov. 1; opens at 7 p.m.; general admission is $12; FastPass tickets are $27. Ghost & Graveyard Tour (221 King St., Alexandria, Va.) -- Follow your tour guide dressed in an 18th century costume down the streets of Alexandria’s historic district, Old town. Get ready to find out more about unsolved mysteries, folklore, and ghosts seeking revenge. Tours begin at 7:30 p.m. nightly; Fri.-Sat. 7:30 p.m. and 9 p.m.; $13 for adults; $7 for children ages 7-17. Ghost Tours of Harpers Ferry (100 Church St., Harpers Ferry, W. Va.) -- Listen to historic ghost stories and walk revenge several blocks of "Lower Town." Learn more about the Civil War and Harpers Ferry's violent history. The tour begins at 8 p.m.; $12 per person; $9 for children ages 8-12.